Luddite – Next Hipster Trend is what's HAWT, NEXT! According to treehugger.com, gas-powered lawn mowers put out as much smog as 40 cars. I don’t know if that’s true or not but I will tell you that it doesn’t matter if it’s true or not and that it’s a great thing for you to say to people when they ask you what the hell you’re doing in your yard. What are you doing? You’re scything of course! 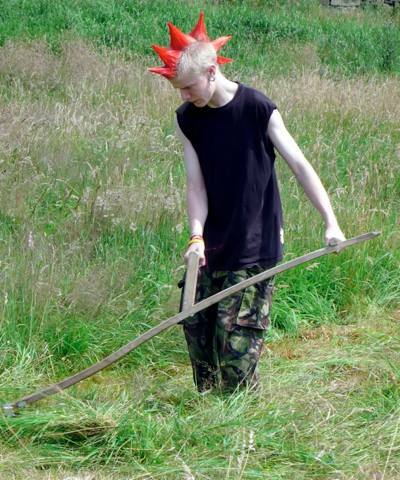 For a long time hipsters have been using old fashioned reel mowers because they feel all old-timey and remind people of the days of Dennis the Menace. But everyone has heard of reel mowers being used again, and there’s even advanced hipsters who bike mow. Reel mowers are OVER!